Mold Abatement, Mold Removal and Remediation - What’s the Difference? The word abate means reduce, lessen, or termination of something that is happening or an object. Therefore, mold abatement, and mold removal are technically the same thing. Mold remediation however, means the act of completely giving a remedy for, which yes it can be the same thing (since it means stopping or reversing). All in all, these terms are used because you’re getting rid of the mold, regardless of which key phrase you are using. So, What Is Mold Abatement, Removal, or Remediation exactly? Getting rid of mold is no easy task. In order to properly remove mold, you have to consider numerous active things that may cause the mold itself. Humidity is one of the number one underlying causes of mold, paired with darkness. Mold doesn’t like to grow in light; instead it likes to grow in damp, dark corners and areas. Removal of mold usually entails removing the initial moisture, killing of the mold and manually getting rid of it, cleaning the area with something such as bleach (or other chemical that helps to kill and remove mold effectively), and then drying the area thoroughly to completely remediate (remove) it. Afterwards though, in order to completely clear up the mold, prevention is also necessary. There must be things set in place so you don’t have repeat experiences with the mold coming back. It can take an entire day to completely rid your house or even one room of mold. The spores are everywhere, even if we can’t see them. You generally have to use an anti-microbial/antifungal cleaner so you can completely eliminate it, since mold is actually a fungus. Sometimes, you have to actually filter the air of the room you’re cleaning so you don’t get yourself sick or spread the spores to other areas of the room or house. There are numerous methods of containment of an area to avoid disturbance of the spores. Do I Have to Be Gone? When you hire a company like Precision Mold Removal or another contractor to help with your mold removal, then yes, they recommend that you leave the home temporarily, but that is literally only for your own safety. 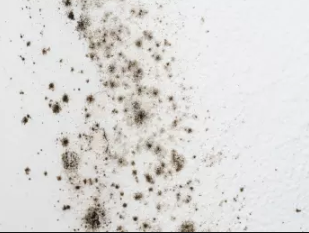 Mold can be potentially deadly if it is disturbed and spread, then ingested or inhaled, and it travels through the air very easily.